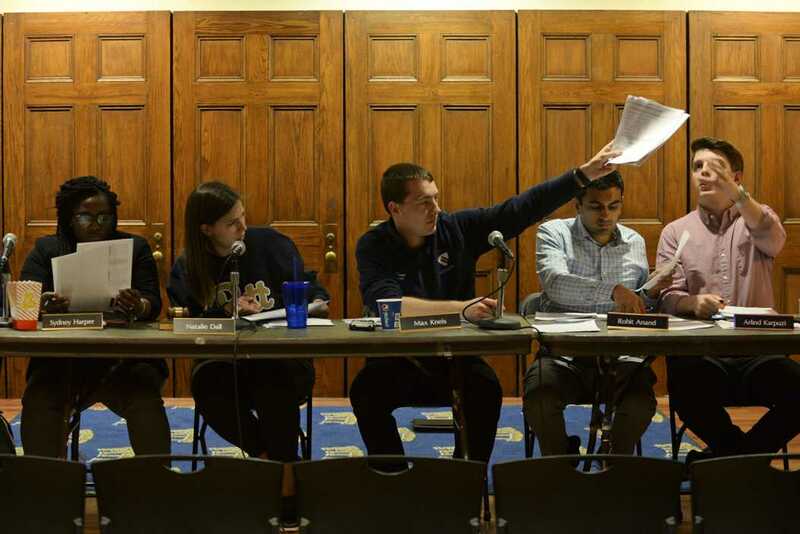 With only two meetings left in the semester, SGB made strides on Tuesday night to institute changes for the next academic school year, outlining future changes to the governing code and pushing their reading day proposal. Board member Rohit Anand proposed adding an extra reading day to give students an additional day without any classes before finals week in both semesters. Currently, the Board is researching the proposal process and comparing Pitt’s academic calendar to similar schools and their reading day policies. After the research phase, SGB will lay out why this is an adequate and necessary change for Pitt students in an administrative proposal. Anand said SGB wants to discuss these changes further with the administration, but declined to explicitly comment on whether or not the changes are feasible. “We have to be flexible with the administration and be willing to engage in meaningful conversations with them to decide the future…we have a good relationship with the registrar’s office,” he said. In other news, President Natalie Dall announced the board will finalize changes to the governing code, the constitution that SGB follows, next week. These changes include officially making the First Year Council and the communications committee part of SGB. In the fall semester, SGB introduced The First Year Council, a group of 10 first-year students working to improve first-year engagement, and the communications committee, which works with the President’s communications director. These ad hoc committees were not explicitly in the governing code, but the board will now officially include them. Before this week, the board updated the online governing code to include previous changes, including the use of gender-neutral pronouns, according to Judicial Chair Jad Hilal. In December, the board updated its election code with similar gender-neutral pronouns. SGB has also made progress with amendments to the responsible action protocol. Hilal presented data on student understanding of the University’s “good Samaritan” policy to the alcohol, drug and tobacco task force. The Pitt Responsible Action Protocol, also known as the “good Samaritan” policy, protects students from legal action if they are reporting a dangerous situation for another student. The 15-member task force includes a Pitt police officer, staff from Student Health and physicians. The Judicial Committee tabled for two weeks to determine how much students understood or followed the policy. They found 43.1 percent of students would not call during an emergency if their friend would receive a police record for the incident. “[Members of the task force] were very responsive to [our data],” Hilal said. The committee plans to post the survey online to increase responses. Previous tabling recorded 239 responses, but Hilal said by increasing their number of responses, they can better lobby the administration to change the code. Club Gymnastics requested $1,341 for their national competition. The Board approved the request in full. Chabad at Pitt requested $2,422.80 for a passover dinner. The Board approved $1,845 and denied $577.80. Robotics and Automation Society requested $4,539.28 for the IR7 competition. The Board approved in full. Delta Sigma Pi requested 1,909.57 for their Grand Chapter Conference. The Board approved $767.89 and denied $1,141.68.